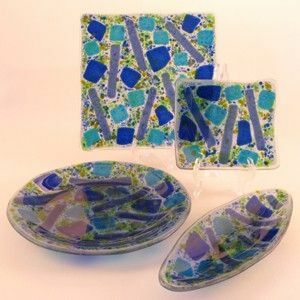 In each of the four different fused glass dishes, geometric shaped glass chips of three blue hues scamper across a field of blue and green ground glass. Each dish was made by assembling the glass and melting it together in a kiln. After cooling, the now solid glass piece was placed over a mold and returned to the kiln, where heating at precise stages softened the glass enough that it sagged into the mold. The 11" square plate, 6" curved square plate, 10.5" oval dish, and 10" round coupe plate are lovely on the table and safe for eating. Each dish in the "Blue Geometry" style is one of a kind and is signed and numbered. We can make your dishes--individual pieces or sets--in other sizes, shapes, and colors.